Yes, after a lengthy hiatus, Bleach has finally returned. Continuing from where we left off, shadows have engulfed the Soul Society as the home base of the Vandenreich appears inside the Seireitei. 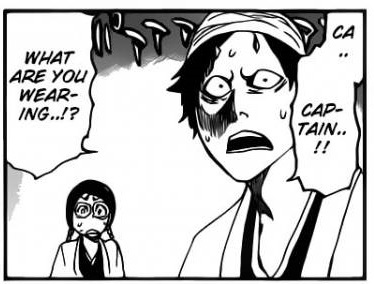 Shunsui, having returned from Karakura Town, tells Nanao how he anticipated an attack, but not one of this scale. 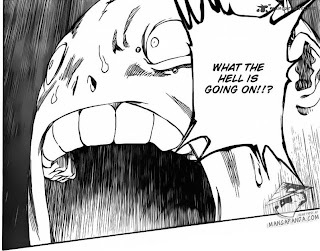 Outside the barrier, Ukitake is informed of the invasion by the third seats of his squad. In Squad 12’s research facility, the scientists are arguing about how the Soul Society disappeared when shadows appear from the machines, and transport everyone there to the Vandenreich’s castle. Due to this, Hiyosu has a ‘mild’ freak out. Meanwhile, Yhwach explains that after the Quincies lost the war 1000 years ago, they escaped from the world of the living into the Soul Society, and from there were able to create space inside the shadows, and hid there. Like I said, a mild freak out. Back with Squad 12, Askin (a.k.a. Charlotte Quincy) appears to have explained things to them. Similarly, Haschwalth confronts Shunsui, and explains how the Quincies were able to invade the Soul Society twice before. After the two introduce themselves to each other, Haschwalth reveals that Yhwach ordered the Sternritter to destroy the Soul Reapers as soon as possible. Back with Askin and the scientists, a portal opens up and Kurotsuchi and Nemu walk through, wearing some...interesting outfits. 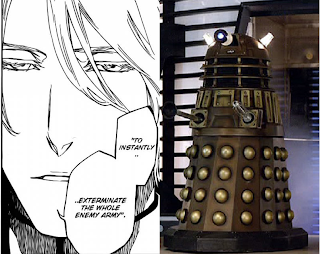 Displaying yet another example of his Batman-like planning ability, Kurotsuchi reveals that he suspected that shadows were critical to the previous invasions, and so modified his lab so that it wouldn’t have any shadows. 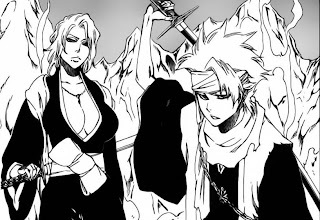 As he confronts Askin, a group of Soul Reapers appear to get roasted by Bazz-B, but it turns out that Hitsugaya managed to freeze the flames, and he and Matsumoto get ready to fight. The method the Vandenreich used to invade was an interesting one, as it means they created an entire pocket dimension to hide in. It also shattered my assumption that the castle had been built in Hueco Mundo, as it turns out it was technically built inside the Soul Society. Apparently, they had just been using Hueco Mundo as a recruiting ground. Someone get the fashion police, now! The fact that Ukitake is outside the barrier is one that I had missed on my first readthrough, but the more I think about it, the more important it seems. After all, why leave one of the most powerful Captains out of the action unless there’s a good reason for it? One theory is that he’ll use his Bankai to get into the barrier, but even then I don’t know if he’d arrive in the deserted Seireitei or in the Vandenreich’s castle. Either way, I hope we get to see his Bankai sooner rather than later. Heroes always arrive at the last minute. Given that three Captains have been matched up against three Quincies, I’m curious to see who else will end up fighting the Sternritter. There are still seven Sternritter unaccounted for, and seven Captains have yet to join in. 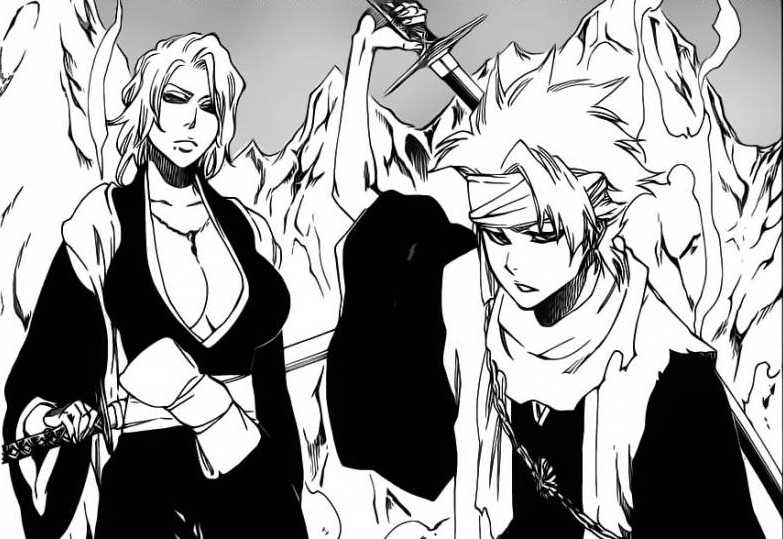 One thing that I didn’t think about is that although Hitsugaya, Sui-Feng, Komamura and Byakuya have all had their Bankais stolen, they’re still able to use their Shikais (although how far that will get them is anyone’s guess). Overall, this was a good week for Bleach. Some interesting fights were set up, the Vandenreich’s method of infiltration was revealed, and it was finally confirmed that Kurotsuchi has no fashion sense. Here’s hoping it continues. Good Things: Vandenreich invasion method is explained. A number of fights were prepared. Kurotsuchi once again channelling Batman. Bad Things: Only the tiniest glimpse of Ichigo. ClayDragon is currently studying Physics at university, and is constantly bewildered by it. The main method of contacting him is his Gmail account at kyleroulston1993@gmail.com. The alternative is his Skype account at kyleroulston1993. When not playing games or reading, he can be found with his head in his hands whilst trying in vain to understand quantum physics. He dreams of one day pulling off a successful Aizen cosplay.